Private and Community-Style Acupuncture Sessions are Available! Appointments include acupuncture, colored light therapy, energy healing, meditation and more. Please call or email Kari to book your appointments. Kari Gardner believes that healing, in its truest form, addresses all levels of an individual in an attempt to eliminate dis-ease and promote wellness. Kari is a NYS licensed acupuncturist and certified Holistic Health Professional. She began her career in 2002 as an acupuncturist's assistant and apprentice. During this time, she earned a masters degree in Acupuncture and Oriental Medicine from the New York Chiropractic College's School of Acupuncture and Oriental Medicine. Additionally, Kari is certified in colored light therapy, radiesthesia, and environmental energy assessment and balancing. Kari has worked in Rochester as an acupuncturist for several years in a variety of settings. Upon moving to Syracuse in early 2009, her practice became focused on acupuncture for fertility and pre-natal wellness. She has worked closely with medical doctors, physical therapists, chiropractors and other complimentary practitioners to offer well-rounded treatment plans using a mixture of healing modalities. Upon joining the Synergy Center, Kari decided to begin offering Community-Style acupuncture care. Kari feels community acupuncture is a perfect fit for the Synergy Center, in particular, so that clients will not have to choose acupuncture or homeopathy/naturopathy/massage/etc., but, can choose acupuncture and their other wellness therapies. Private acupuncture sessions take place while lying down on a massage table. Kari will use tools such as acupuncture, colored lights, guided imagery, body work and energy healing to assess and balance your physical, emotional, mental and spiritual bodies. These sessions can be intense and it is recommended that you have time to rest and process your treatment. Thus, it is best to book your appointment at a time when you do not have to rush off to work right after. It may be difficult to decide whether or not you wish to have a private or community-style session. Please bear in mind that you maintain a high quality of care in a community session. The main differences are that in a community session, you are in a room with others for your session and that you have less one-on-one time with Kari. Some may prefer to start with a private session and then switch to community acupuncture to continue their care. Kari strives to incorporate energy work, meditation and self-healing tools into community sessions. Private sessions simply give her more time to use these tools plus others, such as colored light therapy and bodywork. 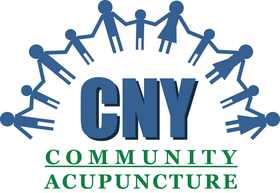 Book your appointments online at CNYCommunityAcu.com!